Located in one of Leamington Spa's most sought after locations is this three bedroom semi-detached house. 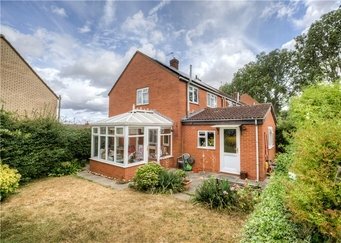 Within close proximity of local schools and amenities this property would make the ideal family home. The ground floor the property comprises of entrance hallway through a porch, bow fronted living room, reconfigured kitchen/dining room with island and a separate utility room with doors leading on to rear gardens. To the first floor there are three bedrooms and a three piece family bathroom, with ample loft and storage space available from the landing. Located in the heart of Cubbington, within easy access of excellent local schools and amenities this property would make the ideal residential purchase or BTL investment. Approach : , Approach via paved driveway providing off road parking for one vehicle. Entrance Hall : , Stairs to first floor, door to living room. Living Room : 3.6m x 3.2m (11'8" x 10'7"), Double glazed bow window to the front aspect, wooden flooring, TV point, telephone point, central heating radiator. Archway through to Kitchen/Diner. Kitchen/Diner : 5.1m x 3.5m (16'9" x 11'6"), Double glazed window to the rear aspect overlooking the rear garden, range of wall and base unit cupboards and drawers, single bowl stainless steel sink and drainer fitted into roll edge worktop with tiled splashback and mixer tap over, island unit with cupboards, oven integrated into island, fitted four ring gas hob with cooker hood over, wooden flooring, inset spotlights. Archway through to utility area. Utility Room : 1.5m x 1.4m (4'10" x 4'5"), Space for white goods, plumbing for washing machine. Door to Conservatory. Conservatory : , Double glazed windows to the side and rear aspect, tiled flooring, central heating radiator. French doors opening onto the side of the property. Landing : , Doors to all bedrooms and family bathroom. Bedroom One : 2.9m x 2.9m (9'7" x 9'6"), Double glazed bow window to the front aspect, built in cupboard, central heating radiator. Bedroom Two : 3.5m x 3.2m (11'7" x 10'6"), Double glazed window to the rear aspect, central heating radiator. Bedroom Three : 2.2m x 1.6m (7'1" x 5'3"), Double glazed window to the front aspect, central heating radiator. Bathroom : , Opaque double glazed window to the rear aspect, low level WC, pedestal wash hand basin, P-shaped panelled bath with shower over, part tiled walls, fully tiled flooring, heated towel rail. Garden : , Patio seating area leading onto level lawn enclosed by timber fence boundary.